We loved being able to to explore the beautiful gardens on this warm, summery day at sunset. 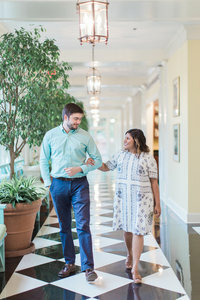 Our favorite part was learning about a brand new spot in the gardens — the one where they got engaged! Check out the photos of Kelsey and Sam at the little pond. The reflection photos were so fun to capture and the light was absolutely perfect. Sam picked such a lovely location to propose to Kelsey. They will be tying the knot later this year not far from the gardens — at Duke Chapel! We are so excited to photograph that and celebrate with them! Kelsey and Sam, we hope you two love these photos as much as we do! We loved getting to explore Duke Gardens with you, especially the spot where you two got engaged. We can’t wait to capture your wedding later this year! Want to see more engagement sessions? Head here! Or, if you’re ready to work with us, start by sending us a quick message!